Oh yes, you (God) shaped me first inside, then out; you formed me in my mother’s womb. The days of my life all prepared before I’d even lived one day,~Psalm 139:13-16. If I asked you what is the most common and destructive tool of the evil one, what would you say? I believe the answer is getting humanity to fail to see who they are from God’s perspective. Insecurity and a fractured identity are crippling. The evil one started with Eve, he spoke a lie to her which implied she wasn’t already created in the image of God. He’s worked throughout the course of history to sow insecurity, shame, and pervert identity. He tried again with Jesus and failed (Matthew 4:6-8). In order to know the purpose or identity of something, one must ask the One (God) who created it. God creates. He did not clone humanity. Each person is a unique expression of His heart and creativity. God created mankind. We did not create ourselves. Nor do I believe we evolved from another animal life form. If we don’t believe we were created by a loving, caring, wise, and good God, then where does our worth come from, what is it’s source? In our world a person’s worth is often measured by their performance+people’s opinions. Another scenario is beauty/outward appearance+people’s opinions. What’s the issue with the formulas? People’s opinions of us can change like the shifting sands. One minute you are loved, the next you’re not. Performances can fall flat or someone more talented or gifted comes along. The standard of beauty changes. What’s hot today may not be tomorrow. If each person is trying to be someone they are not, or trying to prove their worth, we have a life of striving and mini replicas. The original is always more valuable than a copy. What if the puzzles had a box full of the same identical piece? Well, I’d be frustrated. Who didn’t do their job right? Seriously, you had one job (insert laugh here). 🙂 You would not see the picture the artist intended. You’d also be bored. All the different shapes and colors make up a bigger picture. God is the artist who created all the different colors, shapes, personalities, giftings, etc…it’s His picture. It’s His canvas; God is not boring. I paint. I paint collections. Each piece by itself I love. When you see them together it takes on a new meaning. God created humanity with diversity. He did not create one type of person and then clone them. 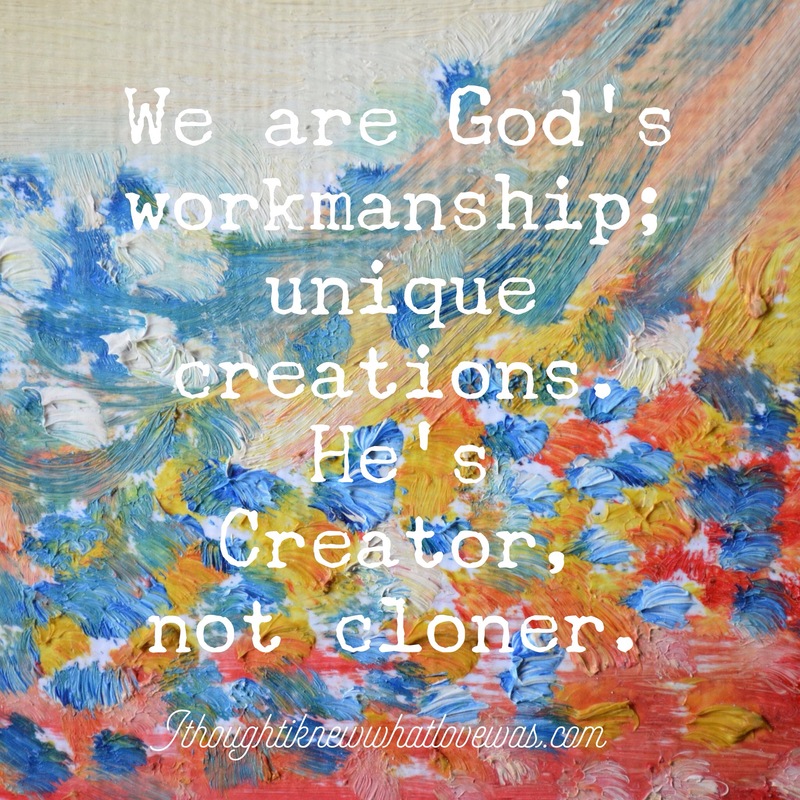 Our attempts to change His design don’t bring Him glory. Our put downs of what He’s made don’t bring Him glory. Our arguing with God about our existence doesn’t bring Him glory. God likes what He made. Who are we to argue with God? I used to want to be someone different. I wanted to be like my dad. He always had something good to say. I wanted to be like my mom. She was effortlessly beautiful and overflowing with kindness and grace. I wanted to be tall. As I got older I wanted a different brain. I process through logic then emotion, which confused and bothered some people. Women are supposed to be super emotional right? Not all of us are. I realized I was insulting God by wanting to be like someone else. Insecurity is actually sin. It’s a fruit of unbelief. It’s refusing to accept that God doesn’t make mistakes. We make them, that doesn’t mean we are a mistake. Behavior does not equal identity. We are who God says we are. Our behavior is a result of what we believe about ourselves or God. 1. We were God’s idea. Parents may not have loved well or chosen a child, but God wants every single child conceived (not just the ones born or wanted by their parents). 2. We are unique. Every human being has unique markers. No two human beings are exactly alike. Even identical twins have different fingerprints and personalities. 3. We are gifted differently to reflect His creative genius. We can’t take credit for natural talents or giftings. They are given by God to bless the world and reflect His creativity; bring Him glory. 4. God created what was really good! When God created humanity He said, “It is very good.” Go back and read Genesis 1. 5. God values diversity! The Bible tells us in the book of Revelation that every tribe, nation, people group, and tongue will be represented in heaven (Revelation 5:9). 6. God establishes true identity that cannot be shaken. If I listened to everything people said about me, about who I am, I’d be a mess. Don’t allow people who don’t know or like who they are to define who you are. What does God say? What He says is truth. I leave you with this poem God wrote on my heart years back. You are deeply loved sweet ones! Lifting you up and expecting great things in your lives in 2016! The best is yet to come.